Orbitz Worldwide has announced that it had reached an agreement with American Airlines (Dallas/Fort Worth) to continue to offer American Airlines and US Airways flights on all of its sites. Consumers should see all available flights immediately. All tickets previously purchased on Orbitz Worldwide sites remain valid. and US Airways flights, to the millions of shoppers who book travel on our global sites each day,” said Sam Fulton, president of Orbitz.com. Copyright Photo: Jay Selman/AirlinersGallery.com. Boeing 777-323 ER N723AN (msn 33125) of American Airlines completes its final approach to the runway at John F. Kennedy International Airport in New York. 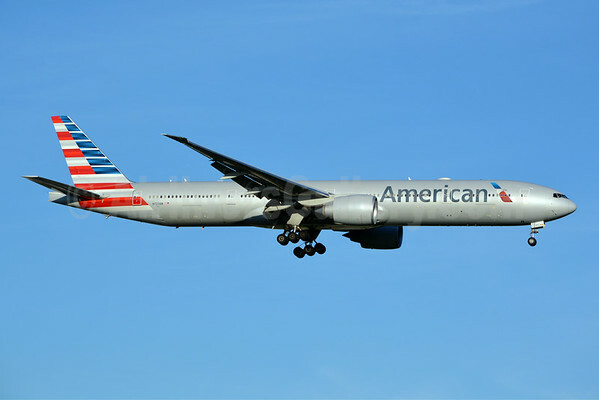 This entry was posted in American Airlines, American Airlines Group and tagged 33125, 777, 777-300, 777-323, American Airlines, Boeing, Boeing 777, Boeing 777-300, JFK, N723AN, New York, Orbitz, Orbitz Worldwide sites, US Airways on August 30, 2014 by Bruce Drum.